Is U.S. Health Care Efficient? In the past weeks, I’ve argued that the US spends more than other countries on health care. This fact is not in dispute. However, one could argue that, if the increased expenditure on health care is buying more health, then the US system might still be efficient. We’re a rich country, and we choose to spend more on health care and get more health because of it. If true, there would be nothing wrong with spending a lot on health. There are a lot of academic studies on this point, and maybe I’ll discuss some of them in future weeks. (My favorite is a paper by Alan Garber and Jonathan Skinner that appeared in the Journal of Economic Perspectives last year entitled “Is American Health Care Uniquely Inefficient?” The short answer is, yes.) Today, I took some time to play around with the OECD health data. The OECD is a group of 30 wealthy, developed countries. If we are going to compare ourselves to other countries, then the OECD is probably the right group of countries to look at. My findings are in four charts. I apologize that the country labels blend together, but the US is conveniently so far from everyone else that it is always easy to identify it! 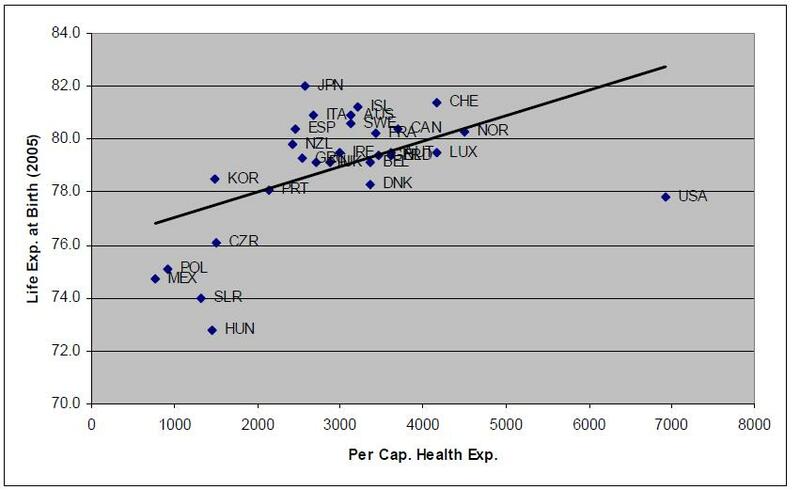 The first compares per capita GDP to per capita health care expenditures. Here, we see what we expect to see. The US spends more per capita on health care than the other OECD countries. 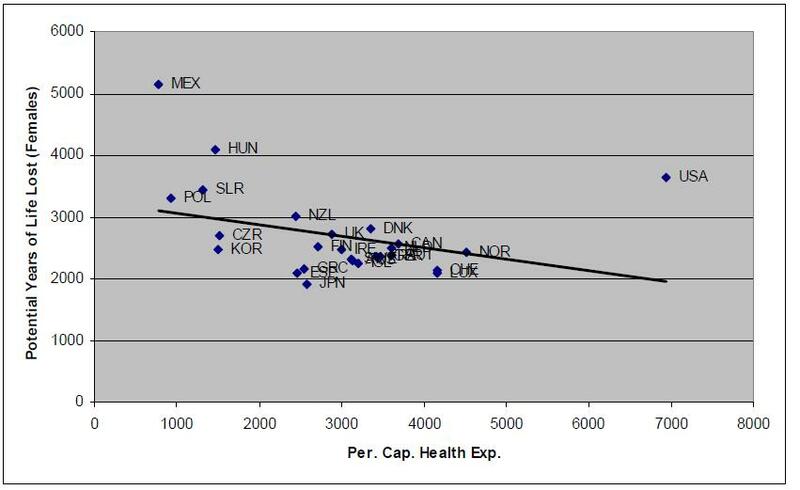 One might expect that wealthier countries spend more on health care, and the trend line shows that this is the case. 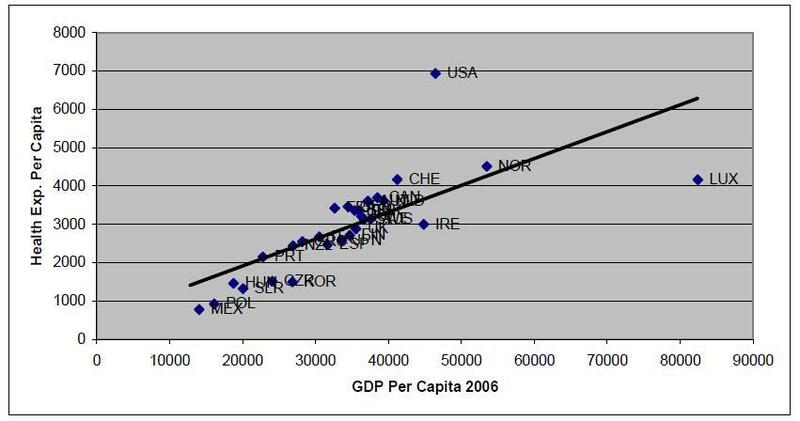 But, the US is way above the trend line, indicating that our expenditure is more than can be accounted for simply by our high per capita GDP. 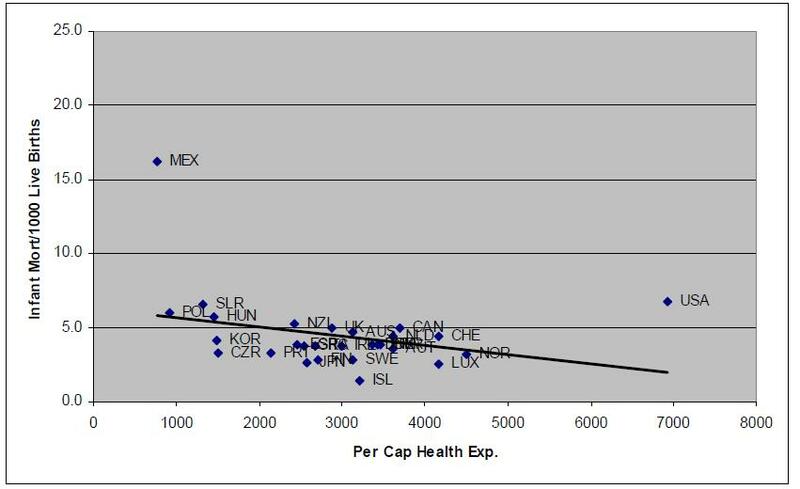 The second chart plots life expectancy from birth (2005) against per-capita health expenditure. Although the trend line shows that, in general, higher health expenditure is associated with higher life expectancy, the US is well below the trend line. Even if you don’t believe in the trend line, it is clear that life expectancy in the US is no larger than it is for other wealthy countries, and the US clearly spends more on health care. The third chart looks at infant mortality per 1000 live births vs. per capita health expenditure. Here, the US is well above the trend line, suggesting that our extra health expenditure is not associated with lower infant mortality. PYLL is preferred as a summary measure of premature mortality since it treats the life year saved – rather than life – as the unit of output.2 In effect, in the calculation of PYLL deaths are weighted according to their prematurity preceding an age limit – 70 in this study. With this age limit, the death of an infant (70 life-years lost) will be given fourteen times the weight given to the death of a person aged 65 (5 years lost). Conventional mortality rates, on the other hand, implicitly give the same weight to all the deaths irrespective of age. Usually, for cross-country comparisons, the number of PYLL is expressed as rate for 100 000 population. Thus, PYLL is a measure of mortality that gives greater weight to young people who die than older people. In general, increased expenditure is associated with a decrease in PYLL. Once again, the US is well above the trend line. Here’s the chart. So, what do we make of this? What is clear from the data is that the US spends more on health care than other countries but our results do not, at first glance, appear in line with this increased expenditure. Before we make too much of it, however, we should all recognize that these charts do not tell a causal story. If, for example, Americans are sicker than other people, it may be that we have to spend as much as we do in order to achieve the rather poor results illustrated in these charts. If we were to reduce our expenditure to a level more in line with other countries, we might do even worse. If that were the case, I’d be fine with the data. Maybe we should even be spending more. In my opinion, the US is so far off the trend line on so many different dimensions of health quality that I tend to believe there is something about our health production function — the way we finance and deliver care in this country — that leads us to spend money without appreciable results. There seem to be many pieces to the puzzle – overuse of technology, paying for procedures instead of paying for health, defensive medicine, and more. There probably isn’t a single source, but rather a lot of smoldering fires that combine to create a lot of smoke. And, given that every player in the health reform debate has their own turf to protect, this makes starting to attack the problem all the more difficult. Tagged Under : benefit, cost, Health Care, OECD, quality, U.S.